The great English mathematician G.H. Hardy, speaking of his Indian protégé Ramanujan (see post 25) once quoted to his colleague Littlewood that “every integer was his [Ramanujan’s] personal friend”. “I like that,” said Littlewood “I wonder who said it?” “You did,” said Hardy. Littlewood tells this story against himself in the wonderful autobiographical “Littlewood’s Miscellany” – a key reference for anyone who wants to understand how mathematicians think, even if half of it is incomprehensible to anyone without a degree in pure mathematics. But for most of us, just catching on to how numbers behave would be a good start. Mathematician and stand-up comedian Matt Parker now offers a helping hand with an app called a polygonal number calculator (http://makeanddo4d.com/polygonal-number-calculator/). It allows the user to visualize numbers geometrically, and to follow how they interact and connect with each other in a variety of ways. It’s great fun, and for many people (especially those who learn best through visual imagery) it may provide a new and helpful way to think about numbers. It’s not the first attempt to relate arithmetic, algebra and geometry – in fact, this is one of the major aims of modern mathematics, as Simon Singh marvelously reveals in Fermat’s Last Theorem. 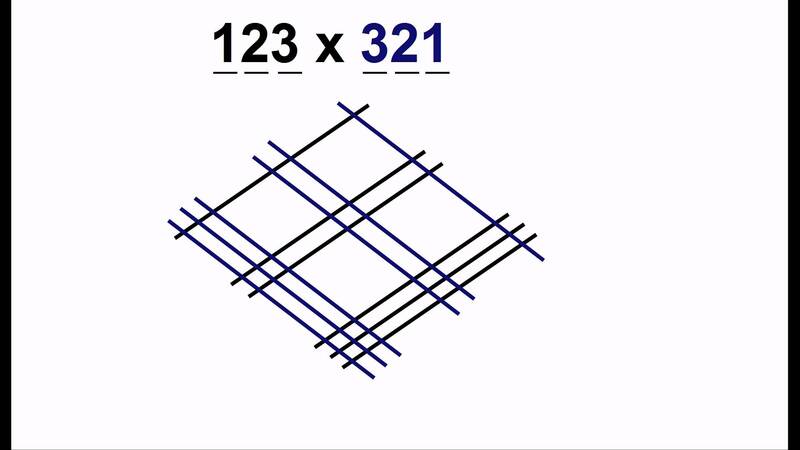 Going back further, someone (history uncertain: http://math.stackexchange.com/questions/886177/where-does-the-visual-multiplication-technique-originate-from) hundreds of years ago came up with a neat geometric method of multiplication. Briefly (as in the image above) draw a series of lines sloping upwards to the right to represent the first number, then a series crossing the first set and sloping downwards to the right to represent the second number. After that, it simply a matter of counting the crossing points. If you want to learn about it in detail, here is a really good video: https://www.youtube.com/watch?v=0SZw8jpfAk0. Now (if you are keen) it’s over to you to work out why it works!